IntelliTrace is an new features of Visual Studio 2010 Ultimate Edition. By default IntelliTrace is enabled . During debugging in Visual Studio, IntelliTrace works in the background and collect debugging information automatically and stored them in IntelliTrace Log File (. iTrace File ) . You can use the log file at any point of time to see what happened exactly at background during your live debugging. One of most draw back of IntelliTrace was to support only 32bit Application. So, If you have are running your application in a 64bit Application, you have to debug your application in 32 bit mode to deal with IntelliTrace. If you are trying to debug an 64 bit application using IntelliTrace you will get below message in IntelliTrace Window. To overcome this issue, you need to change the application platform target to x86 or Any CPU from Build > Configuration Manager. But, Visual Studio 2010 – Service Pack 1 Beta came up with resolution of the above issue. Now you can debug your 64 bit Application using IntelliTrace as well. To test the same, You can change the platform setting either from Build > Configuration or From Project Properties Window. Save the setting and Run the application. Your application is now running on 64 bit mode. Click on “Break All” from IntelliTrace Window. Now, Instead of any error message, You will get details of your IntelliTrace events of IntelliTrace Call Details. If your application is already running on 64bit mode, then just press F5 to start IntelliTrace. 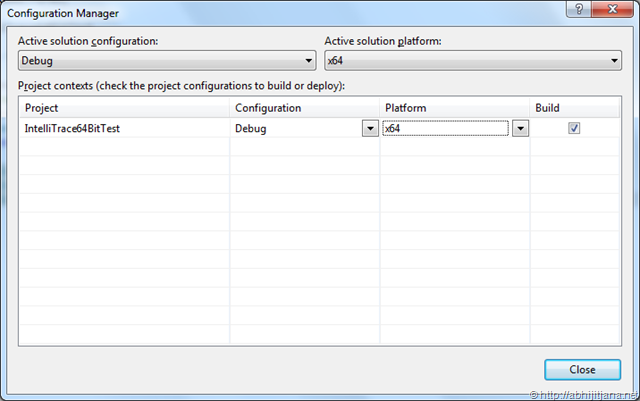 So, Installed Visual Studio 2010 Service Pack 1 Beta and enjoy 64 bit Application Debugging with IntelliTrace . Previous Entry Does IntelliTrace support all the .NET Frameworks ? IntelliTrace is really great feature of VS 2010 and its really usefull. Thanks for sharing information about it.